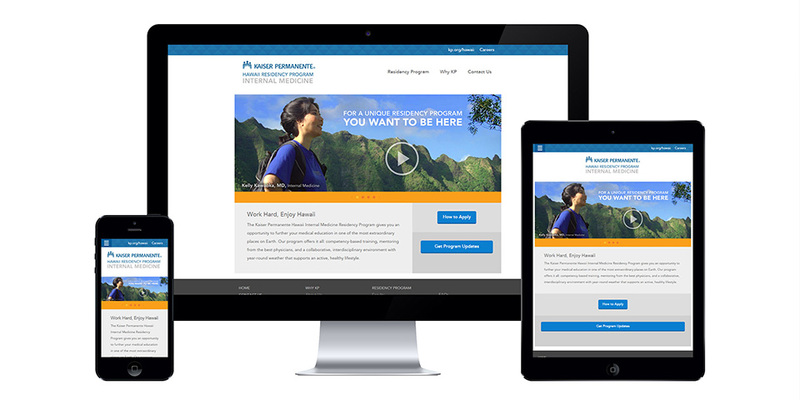 Kaiser Permanente needed to share information about regional services and benefits in Hawaii and build brand reputation awareness with internal audiences and community markets. They also needed to generate broad awareness across the United States with medical schools and associations about a new residency program. We conducted discovery and research to provide a branding and content marketing strategy to reach target audiences through multiple communication channels, using our web design as the central communications hub. The strategy included a social media strategy, program branding, content marketing, videos and media promoting the key benefits or the program and the organization. Over the course of all initiatives, content and media has helped to engage internal audiences and raise brand reputation awareness in the community to enforce active sales and marketing strategies. The organization has seen dramatic growth in membership regionally and the new residency campaign has been successful in exceeding the number of qualified applicants each year.